This paper is not intended to be a treatise on wakeboarding, rather its purpose is to introduce and acquaint the reader with this exciting sport which has so captured the imagination of the young and old alike. It could be defined as the act of being pulled behind a motorboat while riding on a buoyant board resembling a surfboard. But, it is much more than that as I shall attempt to show in both words and pictures. Wakeboarding seemed to evolve much like snowboarding. As boarders became more and more expert, the first thing they wanted to do was grab air, propelling themselves skyward as they went over bumps or off edges of cliffs. But, then, it was not enough to just simply grab big air, they wanted to grab the board with one hand while sailing through the air. Next, they started doing 180’s and 360’s and then flips and flips with twists adding more and more variations as they became more proficient. Halfpipes, a U-shaped bowl that allows riders to move from one wall to the other, were built into the slopes which allowed the snowboarder to propel himself into the air where he could perform acrobatic tricks, twists, flips, grabbing the board, etc. With specially designed boats which create larger waves, and towers and pylons to raise the height of the tow rope, wakeboarders are able to grab large air and perform similar tricks: grabs, inverts, 180’s and 360’s. Although I have equated wakeboarding to snowboarding, its history is more aligned with that of surfing. In the beginning wakeboarders used a surfboard pulled behind a truck which was driven along the shore. Though exciting, it lacked freedom and versatility. In 1985, a California surfer by the name of Tony Finn invented a board he called the Skurfer. This was essentially a smaller version of a surfboard, but it could be pulled behind a boat. It had no foot straps or bindings and was used much like a surfboard with the skier standing anywhere on the board in such a way as to maintain his balance. Later that same year Finn added foot straps to the board which enabled him to execute tricks. Although this was an improvement, the board was still unwieldy and took a strong and athletic person to start from deep water. In the early 1990’s, Herb O’Brien, owner of H. O. Sports, built the first compression-molded neutral-buoyancy wakeboard which he called the Hyperlite and which could easily be submerged for deepwater starts. In a short time, the boards evolved from surf-style shaped to twin-tipped (or twin-tailed). This allowed the boarder to ride either regular or switchstance and perform the same tricks. In 1992, World Sports & Marketing began staging pro events and wakeboarders had an opportunity to show off their skills on ESPN. If you have ever been around a bunch of wakeboarders and listened to them talk, you might think they are from another galaxy, and you need someone to interpret for you. Well, that is what I hope to do here. •Air - A measure of the height a jump gets off the water. "Massive air!" •Backside - A spin where the back of the board goes towards the boat before the front of the board. This is clockwise for regular-footed riders and counter-clockwise for goofy footed riders. "That was a nice backside 180." •Ballast - Weight added to a boat to change the size or shape of the wake. "We need more ballast on the port side." •Biff - Mess up. "I hope I don't biff the landing! •Binding - The mechanism that holds your feet to the board. "I just ripped my bindings." •Board - The deck that you stand on. Short for "wakeboard." "That's a sick board." •Catching an Edge - When an edge of your board goes under water, causing it to stop abruptly. Your body doesn't stop, leading to a hard fall. "I caught an edge going around that turn." •Faceplant - Falling forward. Often the result of catching an edge. "Did you see that dude faceplant?" that goes on the bottom of your board to assist in steering. "My fin just fell off." •Grab - Reaching down and holding onto the board while in the air. "You should add a grab to that spin." •Invert - Any trick where you go upside down. "What was your first invert?" •Ollie - Jumping without using the wake. "I'm going to try to ollie that buoy." •Kicker - A ramp that goes in the water. "He fell going off that kicker." •Raley - A trick where you let your feet float out behind you while in the air, putting you in a "Superman" position. "My friend had internal bleeding from biffing a Raley." •Surface Trick - Any trick done on the surface of the water. Generally spins. "Good job, you got up. Now try a surface 180." •Tantrum - A "trip-flip" in which you do a back flip by "tripping" over the wake. One of the easiest inverts to learn. "The Tantrum was my first invert!" •Trip Flip - A flip done by allowing the wake to knock out your feet from under you causing you to rotate. It's like if you were rollerblading and hit the curb at the same time as you had upwards lift. If you got enough air, your feet would go all the way around and land under you again. "The Tantrum is the most common trip flip." The most common difference between a regular runabout and a wakeboarding boat is the wakeboard tower, normally constructed of thick-walled stainless steel or aluminum tubing, which places the "pull point" about 2 metres (7 ft) off the water's surface. The high tow point gives the rider more control and ease jumping up onto the board. Most wakeboats today also have special ballast tanks which can take in outside water adding to the displacement of the boat thus generating a larger wake. In fact, it is not necessary to have a specially designed wakeboat to engage in this activity. Towers and pylons can be added to a runabout and special water containers, called Fat Sacs, constructed with a whitewater rafting material called Valmex, may be added to the boat to add ballast. Boards are buoyant with the core usually made up of foam or honeycomb mixed with resin and coated with fiberglass. Metal screws are inserted to attach bindings and fins. Like snowboards, wakeboards need bindings attached to the board and into which special boots are inserted which then encase the skier’s foot. Hyperlite is a good example of this kind of arrangement. Some bindings, like those made by Liquid Force, include the binding and boot as one integral piece, which is attached to the wakeboard with metal screws. Federal regulations in the United States require that all passengers on the boat have a USCG approved life jacket. The vest must be in good serviceable condition and the appropriate size for the intended user. A vest that is suitable for wakeboarding, should be one which keeps your head completely above water, is lightweight and is nonrestrictive. •	Nylon vests are cheaper and more easily adjusted for different sized people. •	Neoprene vests are form fitting, softer, allow for more mobility and are warmer than Nylon. 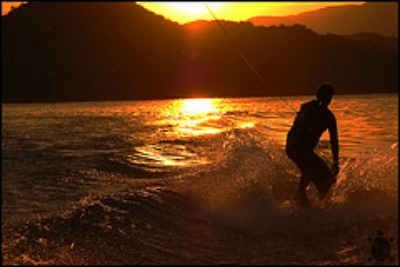 Wakeboarding ropes are different than waterskiing ropes in that they are less stretchy. 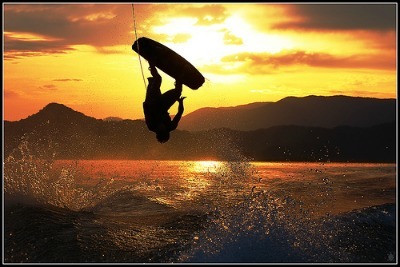 Wakeboarders rely on this fact as they use the rope to propel themselves off the wake. A quality rope has little if any stretch. Ropes come in sizes from 55 to 75 feet. A good beginners rope is around 65 feet. 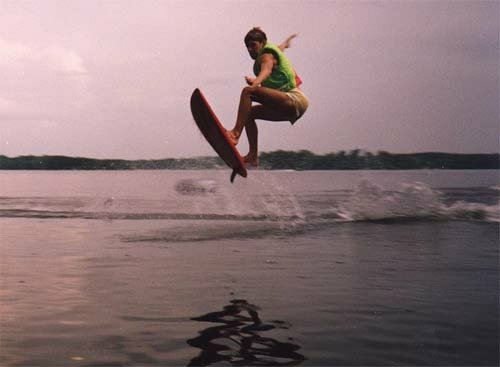 As with ropes, the handles for wakeboarding are different than those for waterskiing. They have wider handles, generally between 13-15 inches wide. With a wider handle it is easier for the boarder to perform certain tricks that entail passing the handle behind the back. What are cable parks for wakeboarding? They are water parks with cable towers spread around the water area. A wakeboard rope and handle is attached to the cable. The boarder holds on to the handle and is pulled around the park. Parks may have jumps spread throughout the water area as well as rails. Rails are simply raised railings which the boarder jumps onto using an Ollie and slides along its length. Depending on their levels of skill and courage they may do tricks along the rail and/or when dismounting. For those of you who are interested, Antelope Marina, now has a cable park and has upgraded it to a two tower cable system. They will be adding a fourth rail so there will be two obstacles for each direction in which the wakeboarder is riding, and the kicker has been resurfaced with plastic to make it slicker. The new cable park will be ready to ride at the beginning of the 2012 season. I urge you to check it out to see if wakeboarding is for you. Don’t worry if you don’t have your own boat and/or wakeboard equipment. They can all be rented at Lake Powell or in nearby Page.